Sealaska Heritage Institute (SHI) is sponsoring a Native Youth Olympics program for all Juneau high school students in an effort to create a team to compete in the state championship for the first time in nearly 30 years. The program, which is co-sponsored by the Juneau School District’s Indian Studies program and the University of Alaska Southeast Wooch Een club, will grow students’ athletic abilities through use of ancient games. The games are based on hunting and survival skills that allowed the indigenous people of Alaska to work together and to thrive in their homeland for thousands of years. While athletes train to compete, NYO games differ from other sports in that cooperation and working together is a key teaching tenet. Even competitors help each other, as this was a key survival skill. Native Youth Olympics is a statewide sport founded in 1972. The event includes 10 events to test skills of strength, agility, balance, endurance and focus. Events include competitions such as One-Foot High Kick, One-Hand Reach, Scissor Broad Jump, Seal Hop, Two-Foot High Kick and Wrist Carry, to name a few. Currently Mt. Edgecumbe High School in Sitka is the only team in Southeast Alaska that competes in the games, though Juneau was represented in the late 1980s. 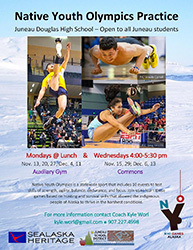 The Juneau program will be taught by Kyle Kaa Yák’w Worl, a decorated champion of the annual World Eskimo-Indian Olympics (WEIO), a competition similar to the Native Youth Olympics that was founded in 1961 in Fairbanks. Worl won eight medals at the WEIO in 2017, including three gold, and ten awards in 2016. In 2017, he also earned WEIO’s Howard Rock Outstanding Athlete award. At Juneau-Douglas High School, practices will be held during lunch every Monday from Nov. 13-Dec. 11 at the auxiliary gym and from 4-5:30 pm every Wednesday from Nov. 15-Dec. 13 in the commons. At Thunder Mountain High School, practices will be held during lunch every Friday on Nov. 17, Dec. 1 and Dec. 8 and from 4-5:30 pm every Monday from Nov. 13-Dec. 11 at the Purple Wing commons. Selected team members will help to raise funds for their travel to Anchorage.